Moritz, William. "Abstract Film and Color Music," in The Spiritual in Art: Abstract Painting 1890-1985. LACMA exhibition catalog, 1986. (EXCERPTS). Images added 2017 by CVM. The dream of creating a color music for the eye comparable with auditory music for the ear dates to antiquity, but so far no universal technical formula has given it the durable, popular basis of the other art forms. Each major figure in color music had to spend a sizable portion of his career inventing or struggling with clumsy, intractable, and ultimately obsolescent machinery. Light is harder to manipulate than sound, but current technology, combining lasers, computers, and video, promises standard console instruments for the composition and reproduction of color music before the turn of the century. Color music is not painting; nevertheless it was a significant precursor for nonobjective painting, both in the aesthetic sense of wrestling with the arrangement and development of color gestures and in the spiritual sense of bringing to painting the cumulative meaning of meditative philosophy. Pythagoras understood that the music of the spheres implied cosmic fusion: the universe embodies a divine geometrical harmony that is mirrored in all natural phenomena, both in the microcosm and macrocosm. The harmonies of celestial orbit parallel the seeming irregularities of life-forms on earth. The bases of these correspondences are mathematically precise vibrations that are manifested as light, sound, fragrance, and other sensual stimuli. Fusing one's perceptions of these seemingly discrete sensory inputs constitutes synesthesia, which Pythagoras considered the greatest philosophical gift and spiritual achievement because it ultimately reconciles the illusory quotidian world with the authentic world of universal, enduring, abstract concepts. For Fischinger's first film experiments (in Germany in 1921-23, exactly when Wilfred was perfecting his clavilux) he invented a wax-slicing machine that could literally show multidimensional forms passing through the plane of the screen to leave personality tracings. The mechanism synchronized the shutter of a camera with the blade of a slicer so that one frame of film would be shot each time a slice was cut from a prepared block of colored kaolin and wax into which any sort of shape could be modeled. The resulting film when projected shows a "living cross section" of the wax block. Forexample, a cone pointed toward the camera would show a dot growing into a larger circle as paper-thin slices disappeared. Fischinger modeled some of the shapes for the wax machine by heating the kaolin and wax and pouring it into cold, swirling oil and water, so that the resulting irregular form arises from the aleatory characteristics of the material rather than from the artist's control. Unfortunately none of Fischinger's Wax Experiments films survives intact, although some fifteen minutes of footage, in fragments from thirty seconds to two minutes in length, can be studied. The originals were tinted and probably had live musical accompaniment, while now we see these mostly black-and-white excerpts silent. The artist's various concepts are exemplified in n-dimensional forms, radiating auras, and, in two of the most striking images, a slowly unfolding rose (which Fischinger associated with the alchemical "great work") and a roselike image over which is superimposed a triple ouroboros (the snake devouring its tail, symbol of cycles). 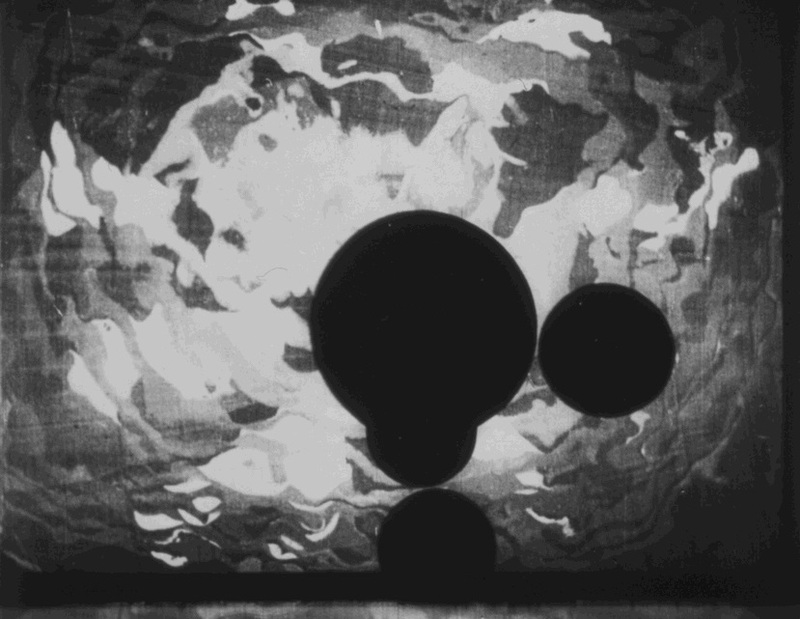 Fischinger's other early film experiments also suggest fourth-dimensional speculations: in one film the superimposition of two concentric circular patterns, rotating in opposite directions, seems to be the personality tracing of a double helix passing through the plane of the screen. Fischinger modified these philosophical concerns, as well as inventively reaffirming them, during the course of his career. In some films of the late 1920s he showed a growing interest in the warped space suggested by Einstein's relativity theory. For example, in Study No. 6 flying wedges bend and swirl into mobile vortices and pierce an eye, which is transfigured into a radiating mandala that spawns a cluster of fragmenting dots, which Fischinger specifically associated with splitting atoms (also in Study No. 8 and Study No. 9). 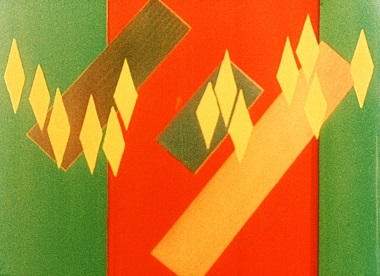 Fischinger considered such visual icons to have the linguistic value of hieroglyphs and thought of his films as "optical discussions" with a genuine power to reason in purely visual terms. Composition in Blue, 1935, for example, was such a discussion confined to a single issue: the yin-yang exchange of positive-negative energy, in which both form and color play significant roles. The interplay between two-dimensional (female/passive) and three-dimensional (male/active) shapes is paralleled by an interchange between colors related to blue (passive) and red (active). The discussion revolves around the possible fourth-dimensional consummation or reconciliation between the apparent polar opposites. Flat, passive blue walls enclose the room in which the action takes place, allowing solid objects to pass through, like personality tracings. These walls gradually take on an active role -- by reflecting the three-dimensional forms, by radiating flat projections and active grids of changing colors, by fanning into a spiral twist of flat strips, by layering infinite (flat) parallel reflections. At the same time solid red cylinders, which are continually passing up and down through the flat planes, generate a frenzy that finally frees two-dimensional disks (now turned to red) to fly off into a free, warped space and cover (and so become identical with) the all-red screen. A further indication of Fischinger's lingering fondness for fourth-dimensional theory appears in his last major film, Motion Painting No. 1, 1947, about which he often commented, smiling, with the alchemical riddle: "In my end is my beginning, in my beginning is my end." Indeed Motion Painting No. 1 is a living cross section, as the Wax Experiments were, only this time as the personality tracing of Fischinger's "mind," as projected in thin layers of paint. In the opening images luminous "comets" rise vertically, and around them materialize spirals, circling the comets in widening orbits. Then flat spirals begin to appear, growing from their own centers and winding wider and wider around themselves. Surely the flat coils are the personality tracings of the orbiting spirals (seen from above) as they pass through the two-dimensional plane of the screen. After 1936 Fischinger lived in California, where there developed a significant school of color music artists, including James Whitney, Jordan Belson, Harry Smith, and Charles Dockum. These artists shared a broad base of spiritual and theoretical influences, encompassing such local figures as Swami Prabhavananda, Swami Paramahansa Yogananda, Krishnamurti, Arnold Schönberg, Aldous Huxley, Alan Watts, Timothy Leary, the Beats, and hippies. Institutional resources included the Philosophical Research Library with its fine collection of classic occult texts, the Theosophical Society publishing house (in Altadena, near the Whitney family home and across the street from Dockum's studio), and the California Institute of Technology, where so much advanced physics and perceptual physiology has been promulgated. Large resident Asian communities practiced Taoism and Buddhism as living religions. Jérôme Carcopino, La Basilique pythagoricienne de la Porte Majeure (Paris: Artisans du Livre, 1944); and Manly P. HaII, Pythagoras (Los Angeles: Philosophical Research Society, 1970). Fischinger's precise sources are often difficult to establish: he was an avid reader throughout his life, but, being poor, he rarely bought books. He spent hours in libraries, sometimes daily, reading both periodicals and books. When an idea caught his fancy, he would obsessively read everything he could find on the topic. This particular background for the wax films was recounted by Fischinger to both Harry Bertoia (in the early 1940s, twenty years after the fact) and James Whitney (in the 1950s). Harry Bertoia, interviews with author, Los Angeles, 1974, Barto, Pennsylvania, 1976-77; and James Whitney, interviews with author, Studio City, California, 1969, 1973, 1981. Calvin Tomkins, The Bride and the Bachelors (New York: Viking, 1968), 86-87; and John Cage, interview with author, New York, 1974. Moritz, "Films of Fischinger," 125 ill., 183.